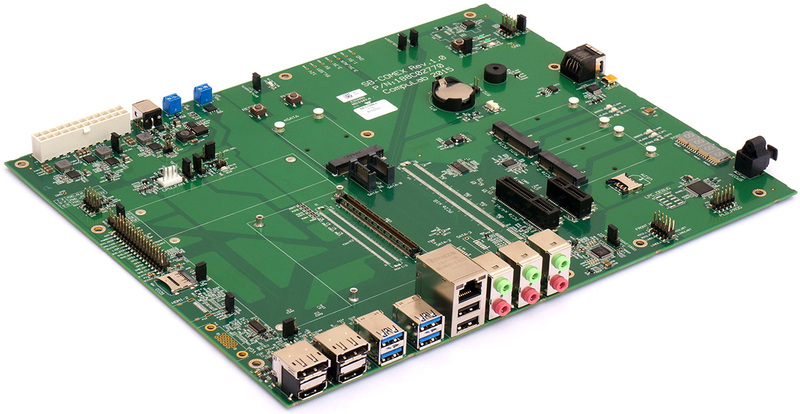 SB-COMEX-T10 is a COM Express carrier board designed as an evaluation platform for COM Express Computer-on-Modules and a reference for custom carrier board development. SB-COMEX-T10 is fully compliant with the COM Express standard. SB-COMEX-T10 has been designed to allow users full and easy access to all functions present on COM Express Type 10 Computer-on-Modules. Combining extensive and highly configurable set of interfaces and connectors with rich debug functionality, SB-COMEX-T10 allows all around evaluation and SW development with COM Express Computer-on-Modules. CompuLab provides SB-COMEX-T10 with comprehensive documentation and hardware design packages including technical manuals, application notes, design schematics and layout design.